While looking thru some videos on youtube, I came across a really interesting one about taking a quarter and making a ring out of it. Well! I had never heard of this, and I just couldn’t stop looking for other videos or links to read. There are actually 2 ways to do this. 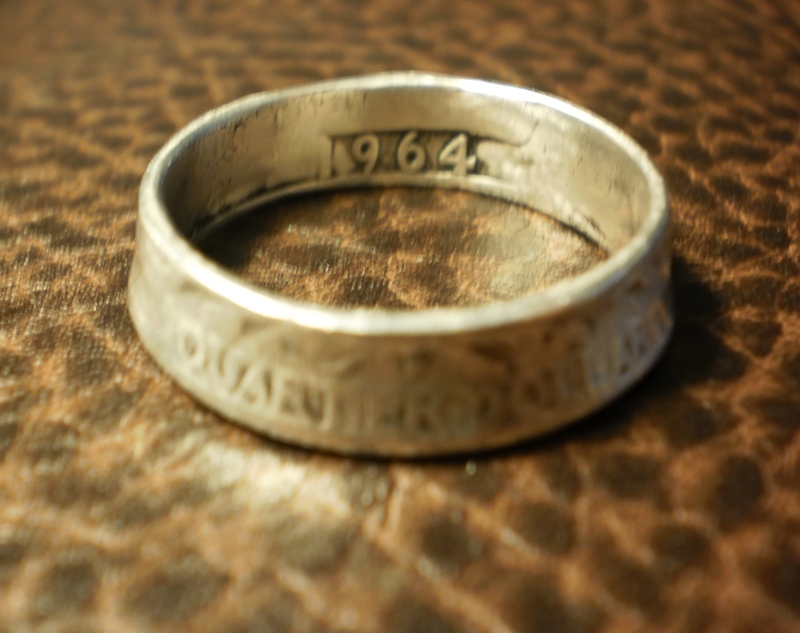 You can make the ring to where the writing on the coin shows on both the inside and outside of the ring, or you can make it to where only the inside will show the writing and outside will be a beautiful shiny band of whatever metal your coin is made of. I tried to make one out of a new penny but its pretty sad that even a penny isn’t really copper anymore isn’t it? Made for a pretty ugly ring. So thankfully a couple of really good enablers gave me a couple of quarters that are actually made of silver. Anything older than 1964 works great. 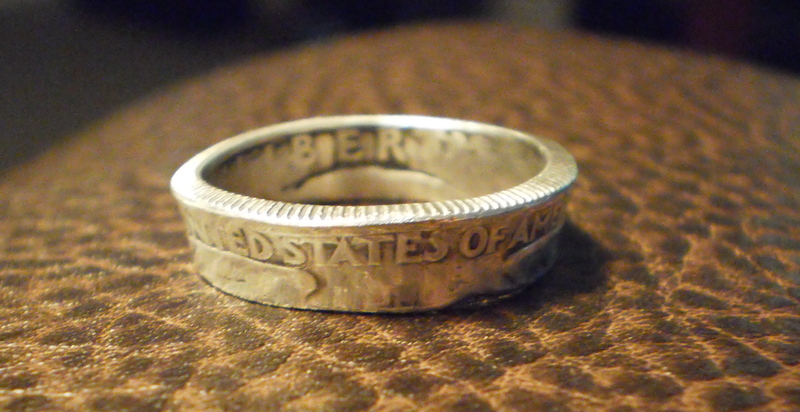 I drilled a small hole in the middle of the coin, then used a jewelers saw to cut out the middle. Then I put the donut looking piece put it on a ring mandrel and started to pound on it with a rubber hammer. You just keep hitting it down the mandrel until it won’t go anymore, by then its pretty flat against the mandrel. Just make sure you hit a couple times then turn the mandrel a little then hit some more. Then you take it off the mandrel, I annealed it to soften it, put it back on the mandrel, the other side up and hit it some more to take the cone shape off and finish it with a little polish. You can use a little oxidizer to make the writing really show. With practice you can make them any size you like. It was fun and there are so many pretty coins out there! This is my favorite link about the coins, the pictures at the bottom of all the different coins is what hooked me. I think that since its a pdf it won’t show as a link so you have to copy the whole link and put it in a browser. But its really worth the read. Here’s a couple of pics of my attempt and I think I’ll be making more of these. I like the thought of a couple having rings of each others birth year. But then you would have to be born 1964 or before, to get the really good silver. Well thanks for stopping by and I hope you get to try and make a few rings for yourself. Let me know if do or if you find any other cool jewelry making ideas.